Emily Roush-Elliott, Enterprise Rose Architectural Fellow with Mississippi State’s Carl Small Town Center, has been selected to participate in the The Outstanding Young Persons (TOYP) Program in Osaka, Japan. Roush-Elliot is one of several young professionals around the world selected to participate in this year’s week-long program in September. Since 1981, the Junior Chamber International Osaka has been inviting 5-10 young people each year who work in a variety of fields all over the world “to encourage mutual understanding and communications beyond national frameworks.” At TOYP, participants discuss, learn and encourage each other on a variety of subjects and learn about Japanese culture. Roush-Elliot will add to the 187 who have attended since the program’s start, including special guests such as Steve Wozniak, the co-Founder of Apple; former presidential aide Roger B. Porter; and Cameron Sinclair, co-founder of Architecture for Humanity. See a full list of past attendees. Greg G. Hall, associate dean of the College of Architecture, Art and Design, participated in TOYP in 1994, and described the program as a valuable opportunity to discuss critical issues with colleagues from around the world as well as Japanese business leaders. Roush-Elliot, who holds a Master of Architecture from the University of Cincinnati and a Bachelor of Science in Design from Arizona State University, began working as a Rose Fellow with the Carl Small Town Center in January 2013 and has been leading the Baptist Town Neighborhood Reinvestment project. During her tenure, she has worked to plan and build a park, playground, streetscapes, signage and community events, as well as open a community center in the Delta community. Additionally, her multi-disciplinary team completed an eleven-unit modular affordable housing project in which low-income families were able to purchase new homes from the Greenwood-Leflore Fuller Center for Housing, utilizing 15-year, 0% interest mortgages. The Enterprise Rose Architectural Fellowship offers a select few of the nation’s finest, early career architects the opportunity for first-hand training and experience in sustainable community design work. Mississippi State’s Carl Small Town Center – a research center in the College of Architecture, Art and Design – was one of just four national organizations to receive an Enterprise Rose Architectural Fellow in 2012. In the historic African American community of Baptist Town in Greenwood, Mississippi, 10 families recently realized the dream of homeownership with Baptist Town Cottages. The preassembled cottages were among the several thousand houses built for families in Mississippi and other Gulf Coast states displaced by Hurricane Katrina in 2005. Working with numerous local partners, the Greenwood/Leflore Fuller Center for Housing acquired the Baptist Town Cottages and sold them to families in 2014. The cottages are part of the Baptist Town neighborhood revitalization project, which includes new parks, streetscape improvements, job training, and a community center. Baptist Town has a rich history stretching back to the post-Civil War era. Residents maintain that their community was one of the first in the Mississippi Delta where freed slaves could own property. Seventy years later, famous blues singers Robert Johnson and David “Honeyboy” Edwards were drawn to the community, based on its reputation as a haven for aspiring musicians who wanted to escape working in the fields. During the 1960s, civil rights groups used Greenwood as a base of operations to reach African Americans in the Mississippi Delta between Memphis and Jackson. Despite the efforts of civil rights leaders, the city of Greenwood continues to be highly segregated and experiences many of the ills associated with segregation. Fifty percent of the estimated 10,000 African American residents of Greenwood live below the federal poverty level. Cut off from the city’s downtown by railroad tracks and a bayou, the Baptist Town neighborhood needs new investment, particularly quality, affordable housing. Many of Baptist Town’s houses were built for sharecroppers and are now largely dilapidated. A Harvard University survey of 165 homes in Baptist Town found that 136 were substandard. According to Emily Roush-Elliott, an architectural fellow at Enterprise Community Partners which manages the cottage project, the built environment often reinforces social and economic inequity instead of helping residents. One of the goals of the Baptist Town Cottages is to reverse some of that inequity by providing desperately needed affordable housing and helping residents build financial equity through homeownership. In 2014, the Greenwood/Leflore Fuller Center for Housing installed the first 11 of 26 cottages that the state had donated to Greenwood several years earlier. The Fuller Center selected families, all of whom were first-time homebuyers, based on need and ability to pay. Other partners on the project included the Greenwood-Leflore-Carroll Economic Development Foundation (GLCEDF), Mississippi State University’s Carl Small Town Center, and Enterprise Community Partners. The Carl Small Town Center was an early proponent of Baptist Town’s rejuvenation, having created a master plan for the community in 2001. That planning effort led to Greenwood hosting a participant in the Enterprise Rose Architectural Fellowship program, which places architects within development organizations to add value to projects through design. The homebuyers were required to volunteer for service in the community or provide sweat equity to complete the cottages. Roush-Elliott and the Fuller Center worked with the future occupants to customize certain features of their homes, such as some architectural details, the color scheme, and the location of their cottage on the development site. The homes and their foundations are designed to withstand hurricane-force winds and have thick walls built with 2x6s instead of 2x4s. The cottages’ tight building envelope reduces heat transfer to help maintain a comfortable indoor temperature. As residents finish their first year in their new homes, the energy performance of the buildings will be compared with that of a typical affordable home in Greenwood. The installation and finishing of the cottages were seen as a “joint investment in both the built environment and human capacity,” says Roush-Elliott, and were used to enhance the job readiness of some Baptist Town residents. Local residents received on-the-job training in carpentry and other building trades as they helped complete the cottages. For work that required technical specialties, the project hired local and minority contractors. 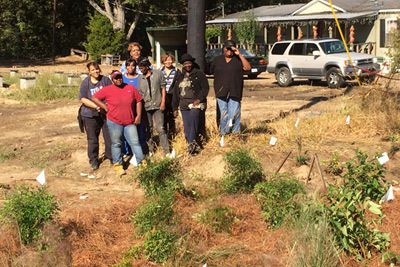 Also, Ladies in the Landscaping, a program that helped train eight minority women in landscaping, completed an eco-friendly stormwater management garden. The homes are affordable to households earning less than 30, 50, 60, or 70 percent of the area median income. The homeowners financed their cottages using no-interest, 15-year mortgages, with average monthly payments ranging from $132 to $159. Through grants from the Federal Home Loan Bank of Dallas, the homeowners received $4,000 in downpayment assistance. Enterprise Community Partners’ Gulf Coast office sponsored homebuying workshops for families that included information on maintaining a home and credit counseling. The total cost of the project was approximately $600,000, including the $232,477 estimated value of the cottages donated by the Mississippi Emergency Management Agency. The Fuller Center invested more than $350,000 in the project, which included a $45,000 loan from GLCEDF and grants and donations from local foundations, businesses, and individuals. The Baptist Town Cottages are part of the larger Baptist Town Neighborhood Investment (BTNI) project, a collaboration involving GLCEDF, the Fuller Center, and other local organizations. Partners in BTNI, with significant funding from the Walton Family Foundation, have invested in public spaces, improved the walkability and visibility of streetscapes, and built a park designed by local youth. These smaller projects helped build community trust and overcome residents’ concerns about redevelopment promoted by nonresidents, says Roush-Elliott. After those projects were completed, residents became very supportive, she says, and actively helped complete the cottages. Residents now manage Baptist Town Community Development, a nonprofit that oversees the Baptist Town Community Center (which offers educational programs and health and fitness training), the community garden, and Baptist Town Day, an event held annually in October. Resident engagement is crucial to the long-term success of the remaining redevelopment projects — most importantly, installing the 15 remaining cottages. Read more about the Baptist Town project. A spirit of cross-state cooperation is causing big things to happen in a little place. To improve quality of life in Greenwood’s Baptist Town neighborhood, Mississippi State University faculty members and students have been working over the past three years with the Greenwood-Leflore-Carroll Economic Development Foundation, the city of Greenwood, Jackson-based Foundation for the Mid-South, and Arkansas’ Walton Family Foundation. Famous for housing blues legend Robert Johnson and well-known actor Morgan Freeman, Baptist Town is a historic African-American neighborhood is located in east Greenwood. Despite its rich cultural history, Baptist Town, like so many small communities in the Delta, faces high unemployment and rising crime rates. Most recently, Baptist Town gained national attention during production of “The Help,” a 2011 film based on a best-selling novel of the same name. The story of 1960s Mississippi civil rights struggles told through the eyes of African-American maids was shot largely in Greenwood and the surrounding area. Today, the commitment by the MSU’s Carl Small Town Center and its other partners is causing Baptist Town revitalization efforts to be realized. The center — the research and service arm of MSU’s College of Architecture, Art and Design — is named for Fred Carl Jr., a Greenwood native and former Viking Range Corp. owner whose major support made the CSTC possible. CSTC was recognized with the 2011 Outstanding Student Project award of the American Planning Association for the 2010 master plan developed for Baptist Town. In 2012, the center was one of only four organizations selected to host a national Enterprise Rose Architectural Fellow. Emily Roush Elliott was chosen to implement the major components of the award-winning Baptist Town master plan. Elliott holds a master’s degree in architecture from the University of Cincinnati, and she has worked with the MSU’s Gulf Coast Community Design Studio. The studio was established in the wake of 2005’s Hurricane Katrina to help rebuild Mississippi’s coastal communities. John Poros, CSTC director, said the Baptist Town plan identified key needs as affordable and functional housing, safer public spaces and improved infrastructure. He and other CSTC representatives have been working closely with Elliott as she collaborates directly with neighborhood residents. Poros said the park is located adjacent to the film home of Help main character “Minnie.” The location one of the few Baptist Town public spaces where residents may sit and talk. Other improvements include additional lighting and sidewalks, and new signage, he said. Poros and Kemp praised Elliott for making significant progress toward meeting the master plan’s major goals: improved housing and a new community center. In addition to coordinating mortgage opportunities for prospective homeowners, they said Elliot is working with subcontractors to begin foundation construction and is coordinating all project efforts directly with the city and city-owned Greenwood Utilities. Kemp said that, while the actual Baptist Town park design was provided by a Greenwood landscape architect, MSU architecture majors worked on all aspects of construction, including grating, digging, shoveling and pouring concrete and gravel, as well as bench building. Poros said the park is lighted, so residents may use it during the evening. Poros said grants from the Jackson and Arkansas foundations paid for construction materials while the CSTC provided funding to cover student labor. Several neighborhood residents, including children, also pitched in to help, he added. You are currently browsing entries tagged with Carl Small Town Center at School Of Architecture News.